We live in a world that craves justice. But what transforms us to truly seek justice, even at cost to ourselves? And what enables us to do so in a way that also offers mercy? 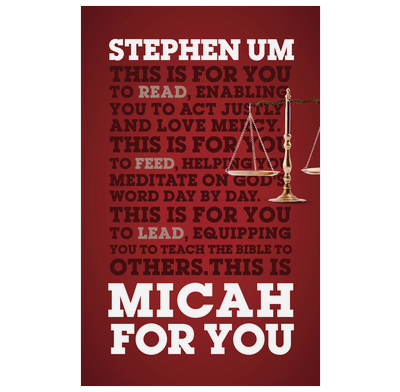 Stephen Um opens up the book of Micah, showing how God’s call to his people then is God’s call to his people now—a call to so enjoy the gospel that we are freed to seek true justice and offer real mercy. This minor prophet is a voice for our times. 9. Did God Do the Math? 11. Who is Like God? 5.3" x 8.5" x 0.7"
Micah for You is a very helpful lay commentary written by an experienced and expert Bible teacher. Stephen Um takes you through the argument of this reforming prophet, not only making sense of the flow of the book but expertly unpacking the nature of sin and idolatry, the threat of judgment, and the need for hope. Micah is well known for his passionate plea for justice and integrity, and through Dr. Um's exposition Micah, though long dead, still speaks to our broken generation. Particularly helpful are the ways in which Dr. Um draws carefully thought-through connections between this prophet in ancient Israel and the Lord Jesus Christ and his gospel.